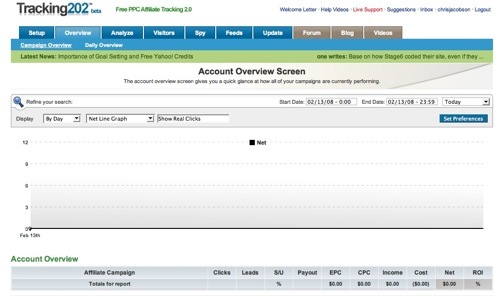 Tracking202.com is an advanced affiliate marketing tracking system. Track converting keywords, affiliate accounts, profit graphs, PPC accounts and more. Once you’re logged into the system, clicking the “Overview” tab will bring up a nice summary of all your affiliate stats, along with some nice charts. Setting things up takes no time at all. Simply add your numerous affiliate accounts by inputing the name of the network and then track your individual campaigns and earnings. There’s also a neat little feature called Spy View, which they describe as, “A live view of visitors interacting with your affiliate campaigns.” Spy View refreshes every 5-10 seconds or so and shows what live visitors on your site are doing. The only drawback? Tracking202 hosts all of your data on their site, which means they have access to it. While I’m sure they wouldn’t go snooping around, the possibility is still there. If that doesn’t concern you though, this is a great piece of a tracking software you can use to organize and monitor all of your affiliate accounts in one central location. I’ve already found this very beneficial myself. The best part? It’s FREE!